Tokidoki Store Opening @ Santa Monica Place! 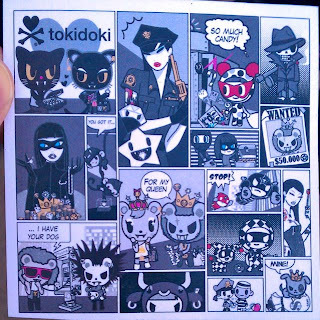 Check out this cool Tokidoki Christmas tree, complete with giant Ciao Ciao! 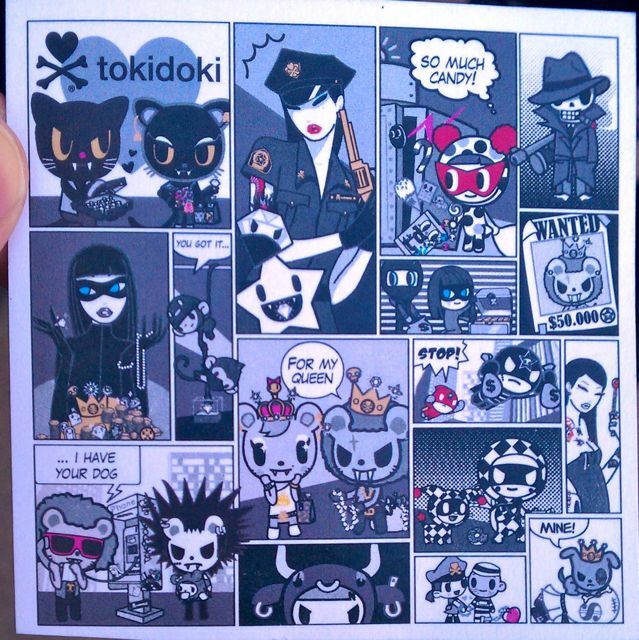 Even the carpet behind the cash register counter was done up with Tokidoki art! Awesome back wall art with custom store screen saver! I currently have an obsession with bold floral prints, thanks in large part to Liberty of London for Target. I managed to find a lot of the kitchen stuff on clearance through Target's website, and a bunch of clothes, bags, and accessories on ebay. The only real problem (aside from spending a lot) is when huge packages arrive and my mom freaks out and thinks I need to take medication. I wonder when buying a lot became a medical issue. I know spending is a sign of mania, but mine is actually very controlled and focused on things that I consider to be good prices. The bulk of my spending last month was related more to a recent trip to San Francisco and then the purchase of a new washing machine and dryer. 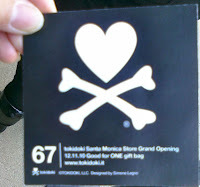 There were a few expensive shopping events aside from that, including the Scott Pilgrim and Tokidoki signings - Black Friday and Cyber Monday definitely did not help my financial situation. There are always positive events that arise out of desperation. My brother finally got a new laptop and I am finally selling lots of yarn and other stuff I don't need. My mom said she'd help me pay for my health insurance, but she says a lot of things. She still thinks I need to see a doctor for spending a lot. I know it's not good to spend money, but I think it's worse to keep old stuff that doesn't work well and using the excuse of being too busy to not clean up after yourself or organize things. Anyways, I'm pretty sure I spoil myself so much now because I was more of a penny pincher before. The economy only improves when people are more willing to spend, not keep their money under a mattress. I like saving money, but I like saving it all the time - not waiting for when everyone else decides to spend. Maybe that's bad for my own bank accounts and credit cards, but it really does make me happy and the stores I buy from happy. It's a win-win! Personally, I can't stand shopping in crowds, which is why I prefer Cyber Monday and online shopping in general. In terms of physical stores, I prefer Target, Wal-Mart, and thrift stores since on occasion since you can often find some great things at rock bottom prices. Shopping like that takes a lot more time than most people have, so I only really get to do that with my brother - who revels in the thrill of the hunt. I enjoy it too, just on occasion rather than as a way of life. It is pretty enjoyable when you do have the time for it.